Back in 1999, when my son, Morgan, was preparing to attend preschool, I began the search for an age-appropriate book for him to share with his classmates about his peanut allergies. He also had several other food allergies, at that time, but his contact reactions to peanuts made it the most worrisome. 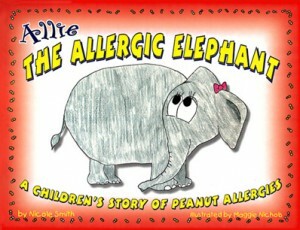 Sadly, there were no children’s books about food allergies anywhere. I came up with a wild idea that I would write a little book about peanut allergies that would teach the other preschool children why Morgan wouldn’t be sharing their snacks and that would also explain to them what an allergic reaction looked like. I thought about what animal was always known to eat peanuts – an elephant of course! I sat down one afternoon and created the text to the entire book based upon the multiple times that I had explained to babysitters what an allergic reaction might look like. Since I’m no artist, I asked a then-middle school neighbor, Maggie Nichols, if she could draw some pictures to go with each of the pages in the book. We put all this together in a spiral bound book to send with Morgan to school. The kids loved the book, as did the teacher. In fact, the preschool assistant told me that she learned a lot about peanut allergies from reading the book to the children! My daughter is 5 years older than Morgan, and was in 3rd grade when Morgan started preschool. Her grade school was having an art fair, and the librarian asked me if I’d be willing to do a book signing for the event. I jumped at the chance to showcase “Allie.” To my surprise, our local newspaper wrote an article about my book signing, complete with a picture of the book cover. It looks a little different than now! That newspaper article ended up being picked up by two dozen newspapers across the USA and Canada. I began getting calls from people wanting to purchase the book. They also wanted to talk about peanut allergies and how was I managing day to day? It opened up our world to help others. In 1999, the Internet wasn’t the knowledge base that it is today. 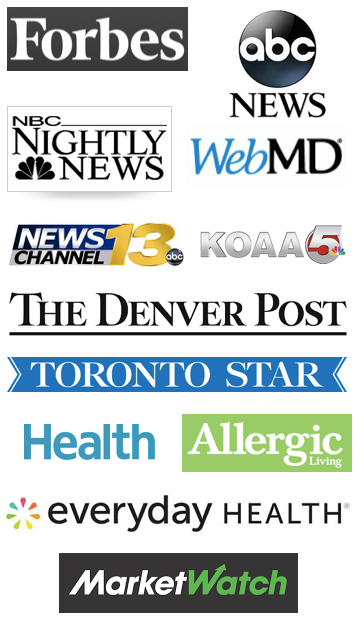 We had felt very isolated trying the manage food allergies. No one in our community knew what we were talking about when we shared that our son had life threatening food allergies! Our initial printing of 300 spiral bound “Allie” books sold out! We tried to get a publisher to print the next printing to no avail. No one was interested in a first time author. Nor were they interested in backing such a niche market. So, my husband and I funded the publishing and printing of the book. 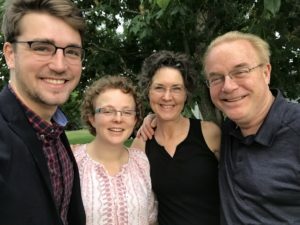 We decided to start AllergicChild.com as a vehicle to sell the book, and to share our experience of living with food allergies. AllergicChild.com came into existence in January of 2000. As they say, “What a long, strange trip it’s been”!! Since then, we’ve updated the pictures of the book with the same illustrator, Maggie Nichols, who grew up and grew into quite an artist! We’ve sold thousands of books through three editions to date. “Allie” is now available in Kindle format too – just to keep up with the times. As for me, I still prefer “Allie” in its book form. There’s something special about reading a book to a child sitting in your lap. And reading a book about managing peanut allergies is even better! Previous PostSummer Camp & Food AllergiesNext PostWhat works to keep food allergic children safe in elementary school?